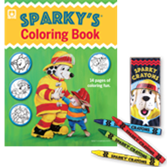 Sparky®'s Coloring Book and Crayons Set draws children into a learning environment filled with important fire safety messages! This Set is the team you need to capture -- and hold -- kids' attention! Just break out boxes of Sparky Crayons along with the latest Sparky's Coloring Book and watch the fun begin! Children will be eager learn all about how to stay fire safe with the all-new 2014 Sparky's Coloring Book. Make sure your family has a home fire escape plan with two ways out of every room. When you hear the smoke alarm go "beep, beep, beep" get outside and stay outside. In a school fire drill walk quickly and quietly to your classroom meeting place. Make sure you have a smoke alarm where you sleep. Have at least one working smoke alarm on every level of your home. Each box of Sparky Crayons displays the safety message "Sparky Says: Test Your Smoke Alarms" and includes four colors: Fire Engine Red, Sparky Yellow, Safety Green, and Water Blue.